If you are trying to avoid any and all spoilers for Avengers: Infinity War, you should probably stop reading right now, because we'll be delving into spoiler territory very soon. 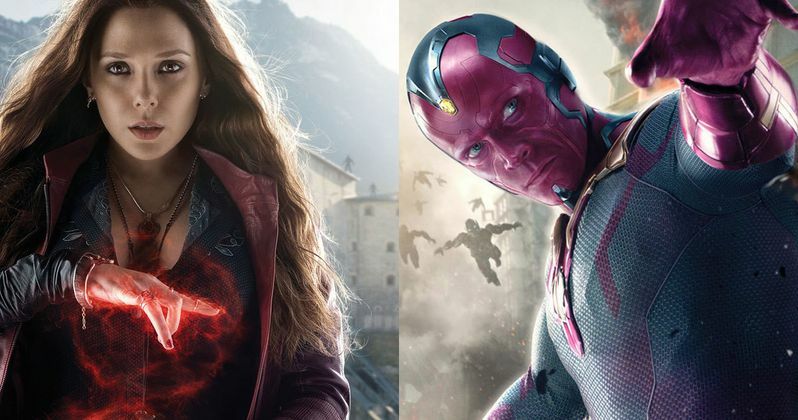 Recent set photos have confirmed that both Paul Bettany is returning as Vision, while other images showed Elizabeth Olsen arriving in Scotland. Today we have a new video from the Edinburgh, Scotland set, which gives us a closer look at a huge spoiler that was revealed earlier this month, so read on at your own risk. Earlier this month, after the separate photos of Paul Bettany and Elizabeth Olsen arrives, new photos surfaced that revealed Paul Bettany's Vision in a human form, as he kisses Scarlet Witch. Both characters have been seen getting closer to one another in Captain America: Civil War, and many assumed that this potential romance was in fact on the horizon, since they have been romantically linked in the comics. A new video surfaced on the YouTube channel HollywoodNow, which was taken from a from another building across the street from where the shoot was taking place. Aside from the kissing, the scene also involves Scarlet Witch placing her hand on Vision's forehead, which, when he's fully decked out in his multi-colored robotic body, is where the Mind Stone, one of the five Infinity Stones, resides, that gave Vision life. It still isn't quite clear why or how Vision appears to be human, but it's possible that this is part of a dream sequence that Scarlet Witch is inducing, which would make sense because, when they're not kissing, Scarlet Witch often has her hands on his face, with hand motions that are quite similar to her movements in previous films, when she was manipulating the minds of others. The Mind Stone is one of the five Infinity Stones that Thanos (Josh Brolin is trying to gather for his Infinity Gauntlet in this new movie. The other stones are the Space Stone, a.k.a. The Tesseract, the Reality Stone, a.k.a. The Aether, the Power Stone, a.k.a. The Orb, and the Time Stone, a.k.a. the Eye of Agamotto. The final stone, the Soul Stone, has not yet been revealed in the Marvel Cinematic Universe yet, but it will likely show up in either Thor: Ragnarok (November 3, 2017) or possibly Black Panther (February 16, 2018), before Avengers: Infinity War hits theaters on May 4, 2018. After Avengers: Infinity War, fans will be treated to Ant-Man and the Wasp on July 6, 2018, with Captain Marvel following on March 8, 2019, before Marvel Phase 3 comes to a close with the currently untitled Avengers 4, which is slated for release on May 3, 2019. Marvel Studios President and Infinity War producer Kevin Feige recently confirmed that the official Avengers 4 title is actually a big spoiler for Avengers: Infinity War, and the first Phase 4 movies are also spoilers as well, so we likely won't get any details on Phase 4 until at least Avengers: Infinity War hits theaters next May. Until then, take a look at this new set video which shows Vision and Scarlet Witch kissing.